When spring arrives it is time to get outside, smell the fresh air, tend the budding garden and enjoy the fruits of the season. 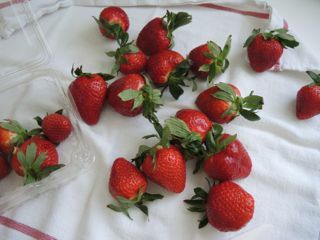 Nothing says spring more than juicy, red, strawberries. Their fragrant aroma smells so sweet. When you partner strawberries with cream you have a match made in heaven. Having been a pastry chef I appreciate an elegant dessert, especially one with an architectural flair. But it has to taste equal, if not better, than it looks or it is not worth making. This dessert succeeds on both fronts and has the added bonus of being surprisingly easy to make for the dramatic results it achieves. It always leaves my guests asking, "How did you do that?" Basically, this is a sophisticated strawberry shortcake. 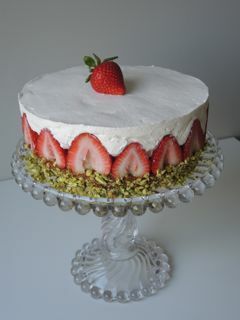 The base is a delicately flavored almond torte upon which the strawberries rest. 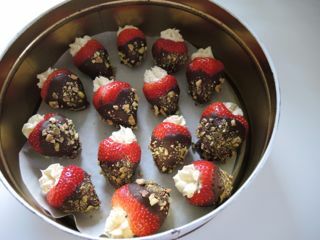 They are topped with a mixture of lightly sweetened whipped cream and creme fraiche. The flavor is a a cross between strawberries and cream and strawberries roman-off. While best eaten the day the dessert is made, it is not difficult to put together. It just needs time to set-up, so plan according. Be sure to use perfectly ripe strawberries for the best taste. This is a perfectly delicious dessert to celebrate all the spring festivities. 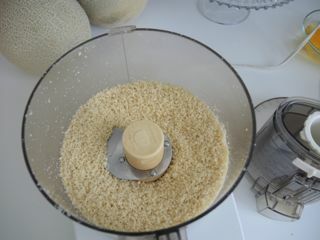 Grind blanched almonds in a food processor until very fine. You can use regular almonds, but the torte will have brown flecks from the almond skins. Melt the butter first, then grind the almonds and whip the egg whites. That will allow the butter to cool slightly before adding it to the whipped egg whites. Sprinkle a third of the ground almonds over the egg whites and fold gently. Alternate between the remaining ground almonds and the melted butter in two batches. Don't add all the butter at once or it will sink to the bottom of the bowl and make it difficult to get it completely folded in without losing a lot of volume. 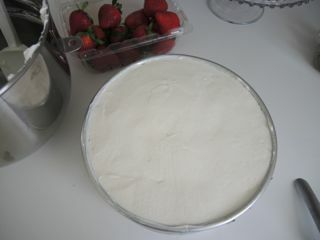 Continue to fold until the mixture is well combined but not deflated. Spread in the prepared pan. Put in the preheated oven for 15-20 minutes. 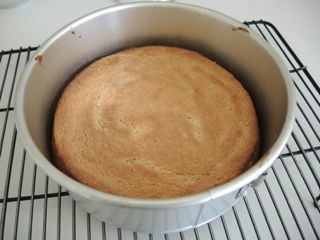 The torte will rise during baking then shrink as it cools. Flip the torte upside down if the top shrinks more than the bottom. 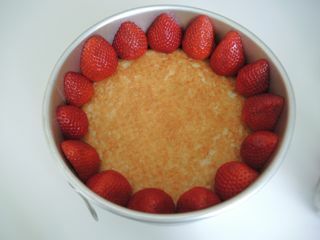 Line the perimeter of the pan with strawberries of equal height. Make sure they touch the sides of the pan and don't go above the rim. 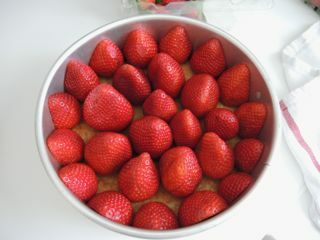 Fill in the rest of the pan with strawberries of equal size. 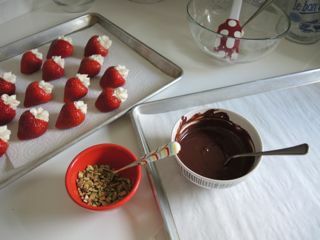 Make sure the strawberries are below the rim of the pan. Spread the creme mixture over the berries. Use a pastry bag if you prefer. Be sure to fill in all the space between the berries and around the sides. Smooth the top even with the rim. 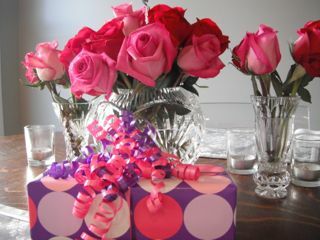 Cover with plastic wrap and refrigerate for at least 2 hours. Adapted from a Food & Wine magazine article by Alice Medrich from 1988. Preheat oven to 400℉ (200℃). 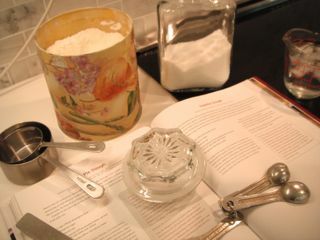 Butter and flour an 8x3 inch springform pan and line the bottom with parchment or waxed paper. 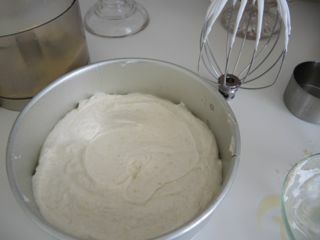 Beat egg whites and cream of tartar until soft peaks form. 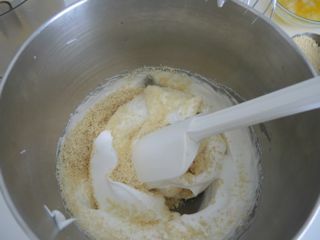 With the mixer running, slowly add 1/2 cup (100 g) sugar, continue beating until stiff peaks form. 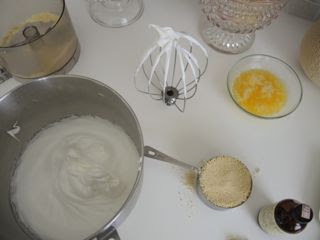 Gently, but thoroughly fold ground almonds, butter, and almond extract into the egg whites a little at a time. Spread in pan and bake 15-20 minutes until golden brown. Cool in the pan on a rake. 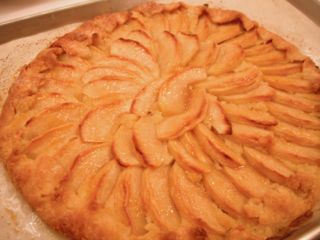 The torte can be made ahead of time. 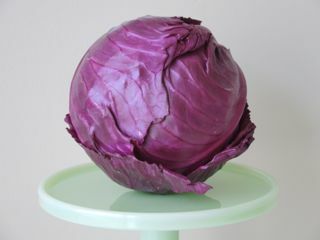 When completely cooled if not using immediately wrap well in plastic wrap and store in the refrigerator up to two days. Make sure to remove the parchment or waxed paper before using the torte. Wash, dry, and reassemble the springform pan. Place torte in the pan. Flip upside down if need be for the torte to reach the edges of the pan. 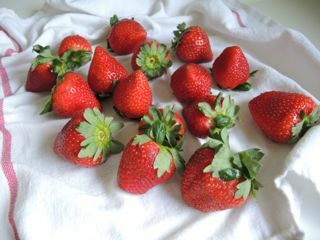 Wash, dry, and remove stems from the strawberries. Cut berries of equal size in half to line the sides of the pan. Make sure they touch the sides, but don't go above the rim. Fill in with the whole berries. All berries should be stem-side down. They should not go above the rim of the pan either, trim if necessary. 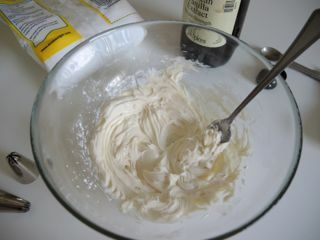 Whip cream until starting to thicken, add the remaining 3 tablespoons (45 g) of sugar. Continue to beat until stiff peaks form. 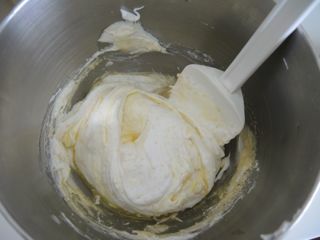 In another bowl beat the creme fraiche until stiff peaks form. 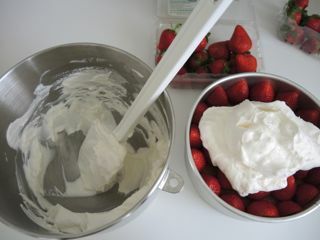 Fold the whipped cream into the creme fraiche. Spread the creme mixture over the berries. Make sure to fill in all the gaps between the berries all the way to the edge of the pan. Use a pastry bag if necessary. Smooth the top. Cover and refrigerate at least 2 hours. 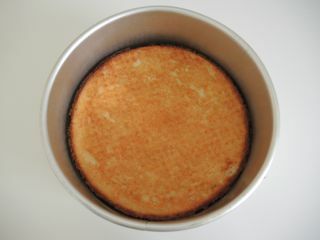 Carefully release springform pan and remove the side of the pan. Warm jam until melted. Add a few drops of water if necessary to make a thin glaze. 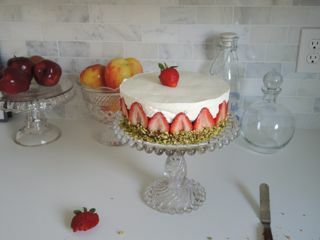 Brush the almond torte with the glaze and press the pistachios into the base. Refrigerate until ready to serve. The torte is best served the day it is made. I truly admire beautiful photographs. 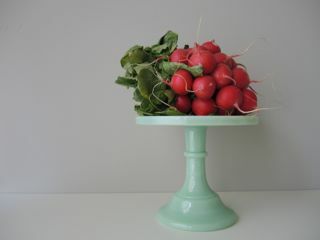 When I created Kitchen and Cake I was excited to take pictures for the blog. I had a new kitchen with large windows and plenty of light. I thought it would be cake (pun intended) to get good shots. After all, the food just lays there. It is not a moving target. If it is, you probably want to double check your recipe. How hard could it be? Turns out, it is a lot harder than I thought. 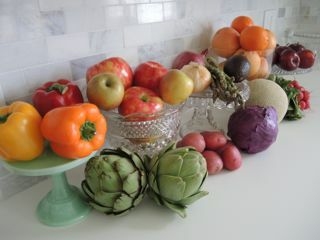 As I have learned, photographing food has plenty of challenges, especially in my kitchen. If I photograph in the morning there can be way too much light. More often than not, it is late in the day by the time I am ready to shoot. Then the light is too dim. What is a girl to do? I have a whole new appreciation and admiration for all the beautiful food blogs out there and all the amazing photographs all over the Internet. It is a lot harder than it looks to get those incredible pictures. Especially when you have to prepare food before you can photograph it. When I don't have any food prepared I practice on anything available. I take lots and lots of photos. 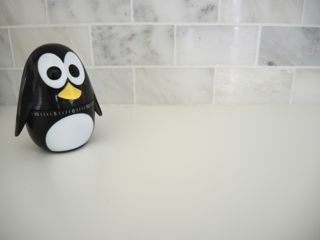 For lack of a better option, when we were remodeling the kitchen I used my phone to take pictures. Photographing food with a phone is not the best idea. The results usually are not all that appealing. At least mine are not. Then I borrowed Maddie's small point and shot camera until she got tired of wiping food off of it. Finally I bought a Nikon Coolpix camera. When it comes to reading manuals, I am not the best at reading all the directions. I am reading Food Photography for Bloggers by Matt Armendariz, too. David Lebovitz has an interesting interview with him on his blog. Mr. Armendariz takes beautiful photographs. His book is full of useful information and is a very entertaining read. Between the Nikon manual and the Food Photography for Bloggers book I am learning all kinds of tricks. I have a long way to go, but I am trying. 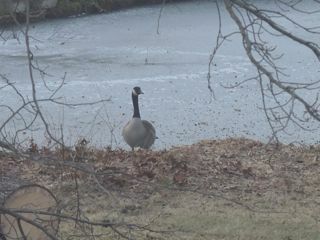 I feel like the paparazzi using the zoom on this unsuspecting goose. 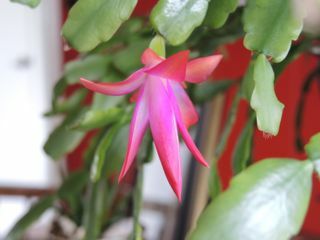 Extreme close up of a Christmas cactus flower. For those who have tried to comment only to have their comment evaporate or not publish you have to enable third party cookies for the browser you are using. For directions google how to enable third party cookies using __________ (fill in your browser name). If you don't want to allow third party cookies you can change it back once you have left a comment. Okay, this isn't about kitchens or cake or anything culinary, but Maddie and I can't stop giggling watching these cute little guys. Enjoy! If you are viewing this post on a phone or iPad there is nothing there. I'm not sure why. I have tried to fix it, but nothing seems to work. If you know how to solve my problem feel free to comment. 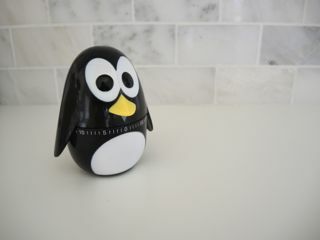 Otherwise, it is supposed to be a penguin video. So, here is the photo equivalent. It is not quite the same effect, but you get the idea. Where I live we are on the backside of winter. 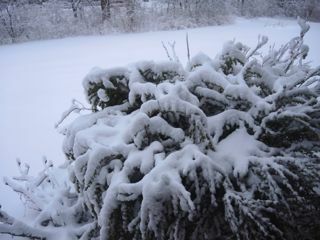 Nonetheless Old Man Winter has graced us with another, and hopefully last dare I say for fear of jinxing it, snowstorm. The peaceful blanket of white makes everything still and quiet allowing me a moment to take stock of the past few months and dream of spring, the garden, and warm weather ahead. But until it arrives I long for soup to warm my body and soul. One of the first things I learned to make as a young bride was soup stock. I watched Julia Child roast bones for her version and read my husband's The Campus Survival Cookbook written by Jacqueline Wood & Joelyn Scott Gilchrist given to him by his grandmother. It seemed an easy and satisfying task. I used to joke that I could get several meals out of one chicken. I would roast the chicken with vegetables to feed us a few meals. When the chicken was gone I would boil the bones with left-over vegetables, if any, and add a few additional vegetables to make a nice, rich stock. Then I would make soup with the stock. One chicken went a long way. Over the years I have made soup for a lot of people usually to rave reviews. When asked what the secret is I tell them it is the homemade stock. I know you can buy ready-made stock and some are pretty good, but nothing beats homemade. It really does make a difference in what you are cooking whether it be soup or sauce. Homemade stock just adds so much more flavor. As I learned from my first try it isn't hard to make stock. 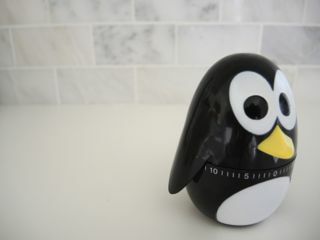 It only takes some time most of which is unsupervised, except for occasionally checking the simmering pot on the stove. You don't need to measure anything or be precise. Just roast some bones and vegetables, simmer gently for a few hours, strain, and voila. You can make stock without bones and use just vegetables, but for a thick, rich stock that turns gelatinous when cold you need bones. 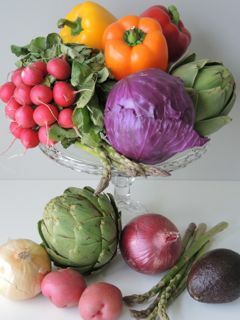 There is no need to peel the vegetables. The nutrients are closest to the skin. Just make sure they are clean. Once you chill the stock in the refrigerator it is easy to remove the fat as it will rise to the top. I rewarm the stock to make it liquid and then store in smaller containers for easy use. Freeze some in ice cube trays, then store in freezer bags to keep handy when making a sauce or stir fry or you just need a little. Store in larger containers for soups and stews. 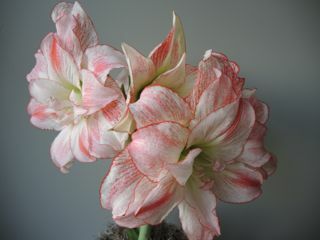 While the stock is gently simmering you will have time to peruse the garden catalogs that arrive this time of year. I am eager to spend time with the new White Flower Farm catalog. 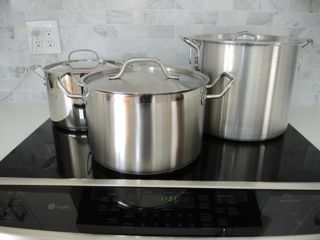 Making stock just takes patience while it comes to fruition. 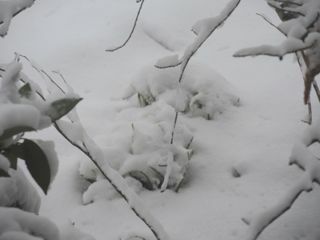 Just like the garden patiently waits for the frozen earth to thaw under a late winter snow. The two little snow-covered mounds in the photo above are snowdrops, appropriately named. They are blooming or were before the snowfall. Once you get in the habit of making your own stock you won't be satisfied with any other kind. I often leave family gatherings with whatever bones are left from our meal. My favorite is the grilled turkey carcass my brother-in-law sends home with me after Thanksgiving dinner at their home. It makes the absolute best stock. It is liquid gold. You can take stock in that. Don't be concerned about the vinegar. It draws the calcium out of the bones which is what makes it like gelatin. The smell and taste will cook out. You will never know it is there. I don't salt my stock. I prefer to add salt later to whatever I am cooking. Feel free to add it if you desire. Roast bones in a 350℉ (175℃) oven for 30-40 minutes until brown. 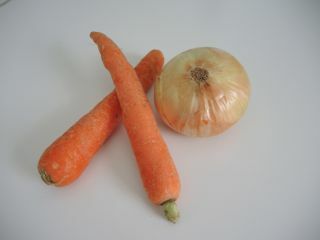 You can also roast the vegetables for a more intensive flavored stock. If roasting both, use one pan for the bones and one pan for the vegetables. Put the bones on the top rack in the oven and the vegetables on the bottom rack. Put roasted bones and vegetables in a stock pot large enough to hold everything or add the raw vegetables if you did not roast them. Add water to cover contents. Add garlic, peppercorns, and vinegar. Bring to a boil, then reduce heat and cover with a lid. Allow stock to simmer gently at least 2 hours and preferably 4-5 hours. Let cool for a while then strain through a fine mesh sieve. Cover and refrigerate. The fat will rise to the top. Once cold it is easy to remove and discard. 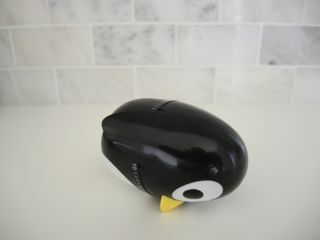 Store stock in the refrigerator for short-term use. To store longer than a week, store in the freezer. I was in a nice chocolate shop early in February in need of a little afternoon pick-me-up. While the salesperson put my tiny chocolate in a pretty little bag she tried to entice me to order chocolate-dipped strawberries for Valentine's Day. Out of curiosity I inquired about the price. I imagine my raised eyebrows were not the reaction she was seeking. Now I'm no stranger to paying a pretty price for food items. The bakery I worked for in California had a very nice product line that was not inexpensive. We made everything by hand in the shop. You expect to pay a premium for high quality, well-executed, goods. Still, the price for one chocolate-dipped berry was rather shocking. As I drove home I started thinking about a chocolate-dipped strawberry I once had in a little food gourmet shop in Los Altos, California. I don't remember the name of the shop, as I only went there once, but the strawberry was filled with a sweetened cream cheese mixture then dipped in chocolate. It was heavenly. The surprise filling elevated it to a special treat. You can use semi-sweet or milk chocolate, but I prefer bittersweet chocolate because it contrasts nicely with the slightly sweet filling. 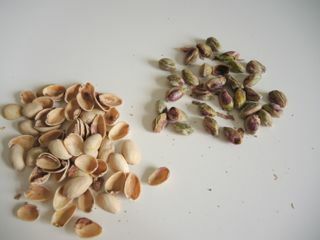 The addition of chopped pistachios add a little salt and crunch. Or forget the nuts if you like. 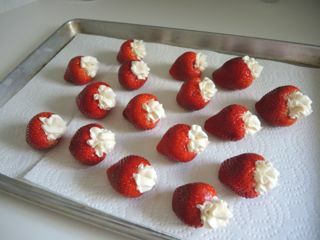 Use the largest strawberries you can find, so there is more room for filling. 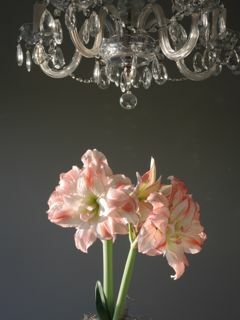 A star or french tip makes a pretty presentations, but a plain tip would work as well. Combine cream cheese, powdered sugar, and vanilla. Stir until creamy. Dry the berries thoroughly before filling and dipping. 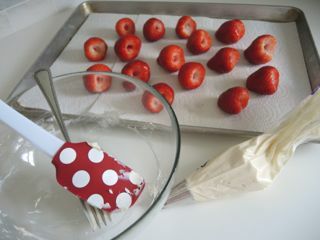 Gently fill the strawberries with the cream cheese mixture. Dip strawberries in chocolate. Sprinkle with pistachios. 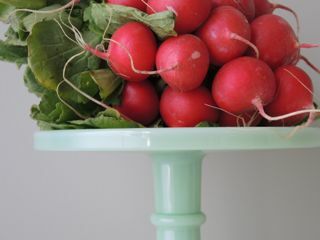 Let set-up on a parchment or wax paper lined tray. Gently wash and dry strawberries. Remove stems. If small you may need to remove some of the flesh to make a larger cavity. Line a tray with parchment or waxed paper and set aside. 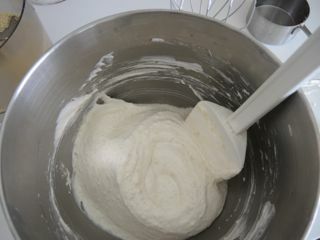 Stir softened cream cheese, powdered sugar, and vanilla until smooth. 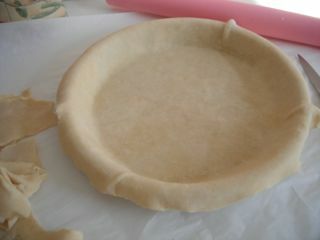 Fill pastry bag fitted with a star or french tip with cream cheese mixture. Fill strawberries until cavity feels full. Dip the opposite end in melted chocolate and sprinkle with nuts, if using. The strawberries are best eaten the day they are made. Refrigerate in a covered container until ready to serve.